That promise encourages a preacher. As I said, the only thing right now between us and God is words, but God has promised to use those words to create and sustain saving faith. The words of the Scripture readings on Sunday morning may be hard to understand, the words of the sermon may not be all that interesting, and the words in the sacraments may be the same old thing every time. But God has promised to be in those words and to use them to keep us in the faith; that is, if we hear them. Jesus said (John 10:27-28), “My sheep hear my voice; I know them and they follow me. I give them eternal life, and they shall never perish, and no one can take them out of my hand.” Those words contain both a promise and a command. The command for you is to be listening to that word of God, to keep putting yourself where that word can be heard. The promise is that we will then hear God’s call and be able to follow him into eternal life. As I think back, it was, I believe, that promise of eternal life that drew me into the ministry. I have often thought about what it means to be called into the ministry. There is, of course, the Letter of Call from a congregation, but before that, even before seminary, there is a call from God. I don’t know how that works, but I remember feeling it already in grade school. Going into the ministry was not ever my only plan, or even my main plan, but it was always there as a possibility, even at nine years old. I’m quite sure it had something to do with this eternal hope. I remember being profoundly affected as a child by the presence of death. I remember very clearly the deaths of elderly relatives, I remember watching boats drag the Minnesota River for the body of a boy I knew at school, and I remember a couple boys from school who died in car accidents. I remember staring for a long time at their empty desks the next day. I remember one death in particular. I was about ten years old and my dad was selling milk truck tanks. A young milk hauler, still in his twenties, drove up from Iowa with his wife to visit my folks on a Sunday and talk about buying a tank. They spent the afternoon at our house and I remember the husband was a really nice guy. And the next day he was dead, killed in an accident with the truck that needed a new tank. I thought about that for days. It had such an impact on me that forty years later I can still remember his name, even though I knew him for only a few hours. His name was Ed Mitchell. In Sunday School I had always heard about how Jesus rose from the dead and how he promised that we too could rise from the dead and live in heaven forever if we believed in him. And I remember thinking, yes, this is what we need, this is important! People should pay attention to this! How could anyone ignore it? Don’t they know that life can end anytime, like it did for Ed Mitchell and my dead friends? If there is an opportunity for another life, people should want to know everything there is to know about that. My pastor knew all about it, and that was what I wanted. I wanted to be like him, I thought, and not only know all there is to know, but also to tell others about it. What could be more important? These thoughts from 40 years ago are still fresh in my mind. What makes a kid in grade school think so much about that? I don’t know, but I think there was already in all of that something of the call of God. Now, 40 years later, I still see the central purpose of my work as opening your eyes a little bit each week to see this eternal hope, found only in Jesus. Day to day life can leave us shackled to the concerns of this world, and this world becomes all we see and think about. We forget that we are going to be here only a little while, and then it will be off to somewhere else. But we must keep this in mind. We need to be prepared. We need to keep our eyes on Jesus and listen to what he has to say to us. The disciples said, “Lord, to whom shall we go? You have the words of eternal life.” Where else could we go for such a hope and promise? There is no place else, no place else to go in all the world where we hear can from someone who has died and then risen from the dead to show us the way to another life. Each Sunday as we gather to worship, we gather to hear the words that remind us of that eternal promise and call us to faith. As a pastor I am called to a ministry of words, not words spoken in a vacuum, but words from me, to you, in this place, on this day. And God has promised to use those words to work faith in your heart. One more thing– even though coming up with the words is the most difficult part of my work, it is the part I enjoy the most and in which I find the most fulfillment. I Corinthians 9:16 — For when I preach the gospel, I cannot boast, since I am compelled to preach. Woe to me if I do not preach the gospel! 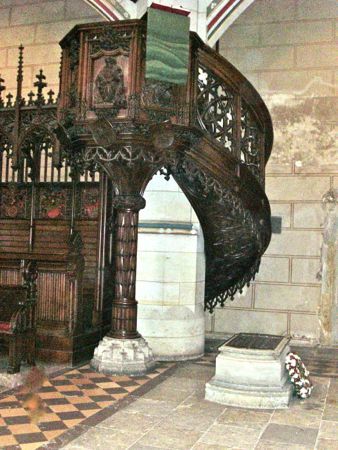 Martin Luther’s pulpit in the Castle Church in Wittenberg, Germany. Luther’s tomb is at the base of the pulpit. This entry was tagged ministry, preacihng. Bookmark the permalink.